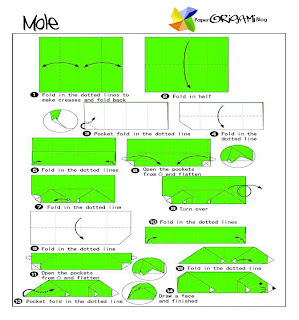 Animals Origami Mole: Moles are small cylindrical mammals adapted to a subterranean lifestyle. They have velvety fur; tiny or invisible ears and eyes; and short, powerful limbs with large paws oriented for digging. The term is especially and most properly used for the true moles, those of the Talpidae family in the order Soricomorpha found in most parts of North America, Asia, and Europe. It also refers to other completely unrelated mammals of Australia and southern Africa which have also evolved the mole body plan; while it is not commonly used for some talpids, such as desmans and shrew-moles, which do not fit the common definition of “mole” as well.